Police officers and teachers in the Chicago area continue to train for active shooter scenarios in the years following several of the nation's worst mass shootings. The sixth anniversary of the shootings at Northern Illinois University is Friday. Six people were killed, including the gunman, and 21 people were injured on the NIU campus in 2008. NBC 5 Investigates was the only news organization invited to attend an active shooter training seminar Tuesday for area law enforcement and teachers. Army Lt. Col. David Grossman (retired) served as guest speaker. Lt. Col. Grossman is a former West Point psychology professor who conducts training seminars for military and law enforcement across the world. He has analyzed many of the nation's mass shootings and one of his conclusions is that the simplest precautions can mean the difference between life and death. Tuesday's seminar focused on preventing school shootings. "In that classroom with the door locked is one of the safest places on the planet," Grossman said. "We do not leave that classroom without a darn good reason." 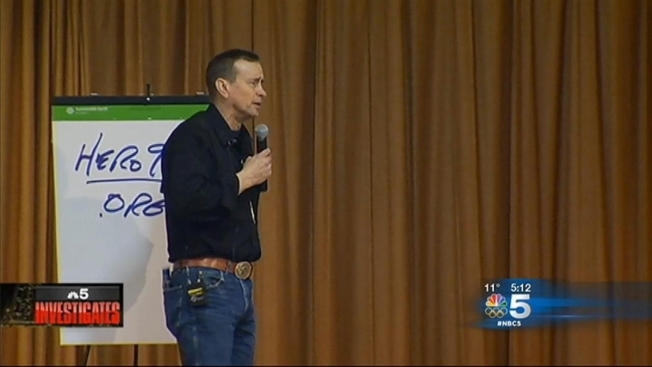 Grossman delivered his message to a packed house of police officers and educators in an event sponsored by the Cook County Department of Homeland Security and Emergency Management, in cooperation with the Illinois Tactical Officers Association and the North East Multi Regional Training Unit. "Law enforcement response to school violence is something that weighs heavily on everyone's mind so this program is an outgrowth to that response from our local partners," said Michael Masters, executive director of Cook County Department of Homeland Security and Emergency Management. Preparing for active shooter situations also occupies the minds of area educators. "If we are honest with our kids and honest with our communities and continue to gather information, we feel like we're doing the best that we can do to keep as many of our kids as safe as much of the time as we can," said Glenbrook South High School assistant principal Ron Bean. Grossman's message to police officers who may be called to respond to active shooter scenarios is to not hesitate and not wait for back up. "We've never had a cop killed by going in first after a mass murder. We can beat these guys. We can kick their tail. Our cops are the best trained, best qualified warriors the world has ever seen and when they go in like thunder they can stop the massacre," Grossman said. Masters said more active shooter training seminars and police demonstrations are expected to take place in Cook County.